This May the USA Racquetball National Championships will be held in Denver, Colorado. For participants to reach nationals they must first compete in a regional qualifier. This year the Mid-Atlantic Regional Qualifier was held at Laurel SportFit from April 17-19 and hosted athletes from mainly Virginia, Maryland and DC, but competitors from many other states were represented as well. The tournment was hosted by the Maryland Washington Racquetball Association (MWRA) which is the official governing body of racquetball in Maryland and the District of Columbia, and is under charter from USA Racquetball. Every year, the Regionals are hosted in a different location. Last year, it was Virginia’s turn to host the event. This year, the event returned to Maryland. Laurel SportFit has been used previously for a variety of events for the Maryland Washington Racquetball Association; however this is the second time that they have hosted a Regionals competition at this venue “Laurel SportFit is a great venue because it has a number of glass courts and excellent sight lines for spectators,” said Mary Helen Sprecher, a member of the Maryland Washington Racquetball Association executive committee. MWRA organizes tournaments year round for players of all ages and skill levels. 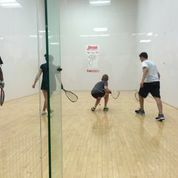 To learn more about the Maryland Washington Racquetball Association visit their website at www.mwraweb.com/index.html.